“Planet Earth” or “Planet Ocean”? Oceans cover about 70% of this planet’s surface; if whales or dolphins had been in charge of naming the place, they’d probably have called it Planet Ocean instead of Planet Earth. Most plastic ends up in oceans through wind and water (rivers, storm drains and sewers). 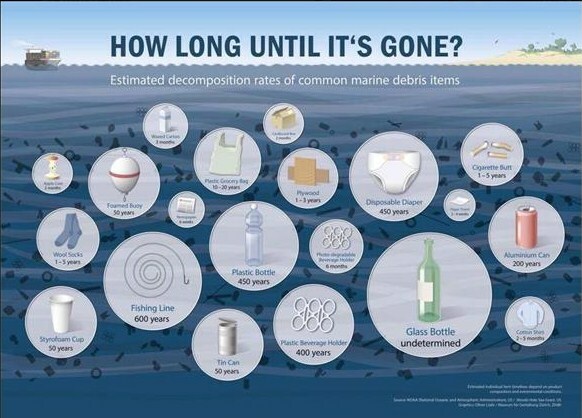 So – please help keep plastic out of our oceans by not littering, and by picking up plastic whenever you can. True story: this week a friend of mine told me how his vehicle’s fuel economy declines each winter. (Not surprising – engines are less efficient in cold temperatures.) But he didn’t get the expected bounce back this spring, so he decided to take his car in for a check-up. The diagnosis? His spark plugs were well past their best before date and were replaced. The result? An instant 25% improvement in fuel economy. Maybe it’s a good reminder to all of us to check our vehicle maintenance records and ensure everything’s up to date. Scheduled maintenance matters – for vehicle life, fuel savings and a reduced carbon footprint.